USGS Interagency grizzly bear study team, the Bridger-Teton National Forest, Yellowstone National Park, & Grand Teton National PArk. The aim of the project is to document the diversity of species that are connected to Red Squirrel middens in the GYE. Grizzly bears excavate Whitebark Pine cones from the middens. In doing so, they disturb the deer mice underneath bringing them to the surface. The mice, along with the presence of the squirrels, consistently attract short-eared owls, martens, long-tailed weasels, and red fox to the middens. Whitebark Pine has suffered pervasive casualties in recent years by the Mountain Pine Beetle epidemic. Over 80% of the Whitebark stands in the Greater Yellowstone Ecosystem have mortality within them. The Mountain Pine Beetle is a native insect that, in the past, has played a role in maintaining the health of the forest. However, the warming climate has disrupted this balance allowing the beetle to spiral out of control, while simultaneously hindering the tree’s natural ability to fight infestations. The nutritious seeds from a Whitebark cone have long been a staple food source for grizzly bears in late summer and fall. Rather than attempting to climb the trees in pursuit of seeds, the bears exclusively feed on the cones that have been harvested and cached by Red Squirrels. When healthy, a Whitebark Pine produces a large cone crop on an average of every two years, this is known as masting. Each cone is full of highly nutritious seeds that provide a rich mix of fat and protein. In years where the Whitebark cone crop is abundant, grizzlies spend far more time at high elevations where the Whitebark is located. This results in fewer bear-human conflicts, and therefore higher survival rates for the bears. The bears will excavate enormous amounts of earth and heavy logs in pursuit of the cones. The distinct hump on a grizzly’s back is a muscle utilized to dig dens, rip open logs, or in this case, plow a midden. The bears use their keen sense of smell to determine where the cones are hidden. It may seem like a lot of work for a such a small reward, but an individual Whitebark cone can hold up to 80 seeds. Whitebark Pine trees don’t produce a crop of cones until around the age of 30, and have been documented at over 1,000 years old. The midden pictured above, located at the base of an ancient and now deceased Whitebark tree, could be hundreds of years old. It was likely started by squirrels years ago when this giant tree was still alive and producing cones. 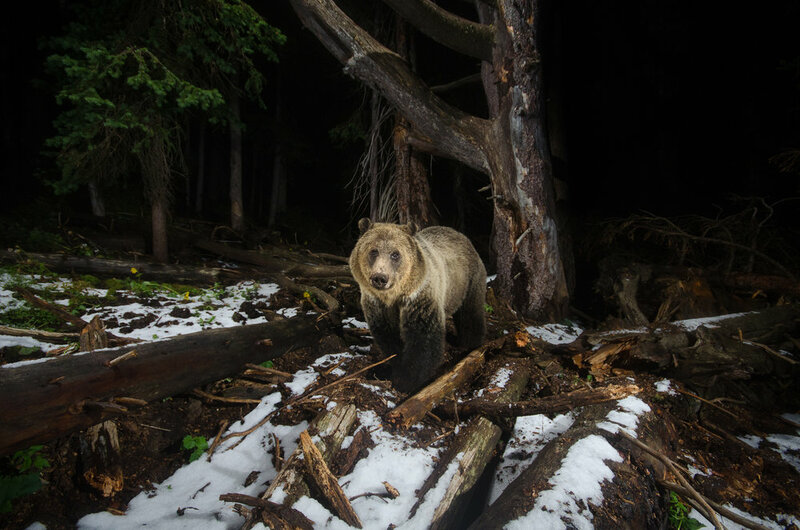 The aim of the project was to document the role of the Yellowstone Cutthroat Trout as a recovering food resource in the Greater Yellowstone Ecosystem, particularly for the increasing number of black and grizzly bears, which have begun to again utilize the trout in recent years. Over the past 20 years, the Yellowstone Cutthroat population has plummeted by 90% due to the arrival of invasive Lake Trout to Yellowstone Lake. Historically, the Yellowstone Cutthroat was a significant food resource for bears in the Greater Yellowstone Ecosystem. In the spring and early summer, cutthroat leave the lake and ascend over 60 different tributaries to spawn, where they are fed upon by bears and other species. In the 80’s, before the detrimental effect of Lake Trout predation on Yellowstone Cutthroat, bears frequented 93% of these tributaries. In an alarming contrast, no bear activity whatsoever was documented on any of the streams in 2008, 2009, 2011. Bears were forced to rely more heavily on alternative food sources during this time of year, such as elk calves. However, Yellowstone National Park has led a valiant effort in Lake Trout suppression via extensive gillnetting procedures over the years. Between 2012 and 2016, 1.5 million lake trout were removed from Yellowstone Lake. A tremendous amount of work remains to be completed, but in recent years the positive effect of this effort has become tangible. Bears are once again fishing for Yellowstone Cutthroat trout in various tributaries. While the usage is limited in comparison to historical numbers, the evidence of bears returning to this food source is encouraging.